We are a growing team at the Estación Biológica de Doñana (Spanish National Research Council, CSIC). We have broad interests within the ecology and evolution of birds and their symbionts (see Research). Each member develops his/her own research, with different topics and approaches. We also have the pleasure to collaborate with several international collaborators. Inquiries from prospective students and postdoctoral researchers are welcome. 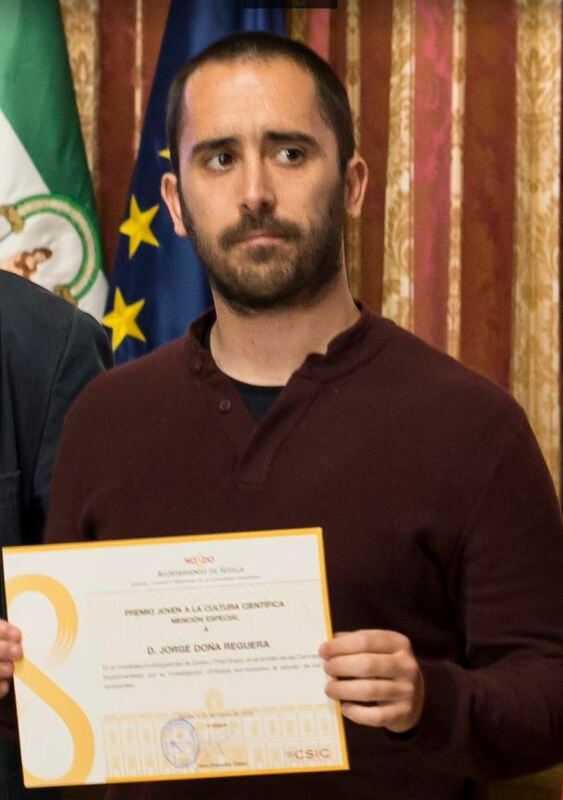 March 22, 2018 Big congrats to Jorge for his “Premio Joven a la Cultura Científica” from Sevilla’s city council! Dic 1, 2017 Shane Brien and Lela Tierney are visiting scholars (Erasmus Plus program) in our lab. They are working on several experiments about the basic biology of feather mites and helping us in setting up the feather mites’ captive breeding program. Great job! Nov 27, 2017 NEW PAPER (GEB) Host specificity, infrequent major host switching and the diversification of highly host-specific symbionts: The case of vane-dwelling feather mites. Nov 2, 2017 Roger receives the “Premio Francisco Bernis a la Investigación” from SEO-BirdLife. Nov 2, 2017 Jorge talks about the diversification of feather mites at XXIII Congreso Español de Ornitología (SEO/BirdLife). Nov 2, 2017 Invited talk by Roger about bird collective behaviour at XXIII Congreso Español de Ornitología (SEO/BirdLife). Oct 4, 2017 Jorge will give a talk about the history of diversification of feather mites at CICA (Universidade da Coruña). Sept 6, 2017 NEW PAPER (Science Advances) Parasite biodiversity faces extinction and redistribution in a changing climate. Aug 17, 2017 NEW PAPER (Am. Nat.) Should I change or should I go? Phenotypic plasticity and matching habitat choice in the adaptation to environmental heterogeneity. Aug 12, 2017 NEW PAPER (Mol. Phylogenet. Evol.) Cophylogenetic analyses reveal extensive host-shift speciation in a highly specialized and host-specific symbiont system. Jul 29, 2017 NEW PAPER (Genome) PCR cycles above routine numbers do not compromise high-throughput DNA barcoding results. May 23, 2017 NEW PAPER (Trends Parasitol.) Opening the doors of parasitology journals to other symbionts. May 7, 2017 Glad to have had Kevin P. Johnson in JovaniLab during this week. Many cool joint projects on bird lice – feather mites ahead. September 25, 2016 Jorge is attending the XXV International Congress of Entomology. July 5, 2016 Oikos cover featuring our paper on seabird colony size and foraging range. Photo by Richard Shucksmith. January 18-21, 2016. Jorge is attending the 5th conference of the Spanish Society for Evolutionary Biology. October 28, 2015 – NEW PAPER (Ecology and Evolution). Species mtDNA genetic diversity explained by infrapopulation size in a host-symbiont system. October 15, 2015 – NEW PAPER (Mitochondrial DNA). DNA barcoding of Iberian Peninsula and North Africa Tawny Owls. September 19, 2015 – NEW PAPER (Oikos). Colony size and foraging range in seabirds. July 15, 2015 – NEW PAPER (Journal of Evolutionary Biology). Context-dependent effects of yolk androgens on nestling growth and immune function in chicks of a multi-brooded passerine. July 7-17, 2015. Jorge is learning about phylogenies and genealogies on the XIII course of “DNA Phylogenies and Genealogies: Reconstruction and applications” at the University of Barcelona. July 3, 2015 – NEW PAPER (Experimental and Applied Acaroloy). NGS metabarcoding proves successful for quantitative assessment of symbiont abundance: the case of feather mites on birds. June 22, 2015 – Our “Bird-sky networks” Ecology paper awarded (2000 Euros) as best paper in PostDoc category in Estación Biológica de Doñana (CSIC). June 22, 2015 – Jorge is visiting AllGenetics. He will be there working on metabarcoding libraries for two weeks. June 16, 2015 – Roger gives the talk “Colony size and foraging range in seabirds” at the “4º Congreso Ibérico de Ecología”, Coimbra (Portugal).